On March the Italian Shipyard celebrated in Livorno the christening of 108-meter giga yacht FB275, following closely on the heels of the launch in Viareggio of BD105, the fifth unit of the elegant and classically styled 29-meter Delfino 95. The generously spaced and welcoming interiors of the yacht are decorated with innovative combinations of marble, polished brass inserts and ash, eucalyptus and tay wood, creating an interesting alternation of textures and colour tones. The exteriors designed by Giorgio M. Cassetta provide a cue for interesting plays of light in the interiors through extensive glazed surfaces. The owner’s cabin on BD105 has a bed adorned with sophisticated leather-upholstered headrests and a spacious bathroom fitted with tub, shower and mini bar. The two 1,000 hp Man V8 engines provide a range of about 2,400 nautical miles at a cruising speed of 10 knots. And when time is of the essence, the yacht has a top speed of 14.5 knots. 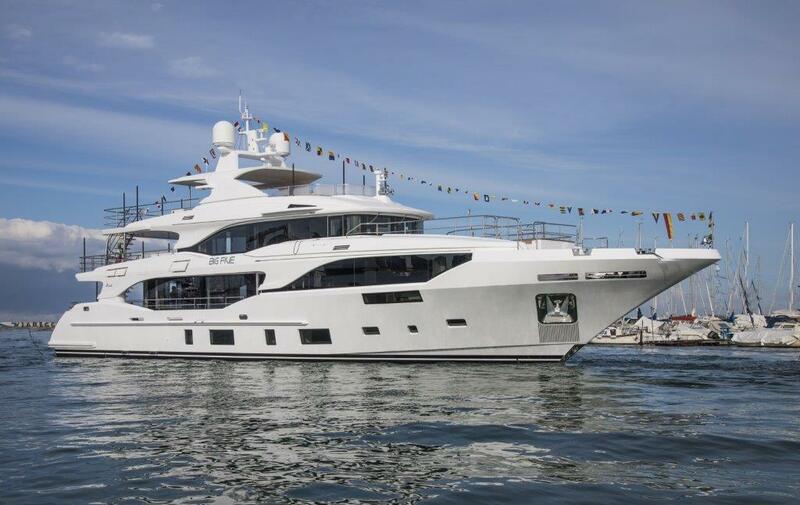 April saw furthermore the launch of BS012, the twelfth unit of the 40-meter Classic Supreme 132 with exteriors by Stefano Righini. 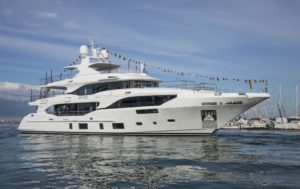 The interiors are by Benetti’s Interior Style Department, which chose the decorations and furnishings based on the owner’s instructions and requests. To give the boat more character, they feature leathers with an iridescent metallic appearance and richly veined varieties of marble: Port Laurent, Sahara Noir and Rino White. The juxtaposition of light-coloured smoked eucalyptus against the dark tones of matte-finish tay wood is clearly dominated by lighter colourways to give the settings a brighter atmosphere and the yacht an eclectic, modern feel. The social side of BS012’s character can be seen in the decision to put a teppan griddle in the centre of the table on the Fly Deck. In a first-of-its-kind solution for this model yacht, guests eat their food directly from the griddle on which it is cooked. Extensive outdoor spaces, particularly on the Sun and Upper Decks, are perfectly reconciled with the yacht’s streamlined contours, while the big full-height windows on both the Main and Upper Decks translate into brightly-lit interiors. Forward of the Pilot House, a Jacuzzi offers a spectacular vantage point from which to enjoy the sea view.